This is the 2016 event, which has passed. To see a list of current and upcoming events, visit www.cedbr.org/events. 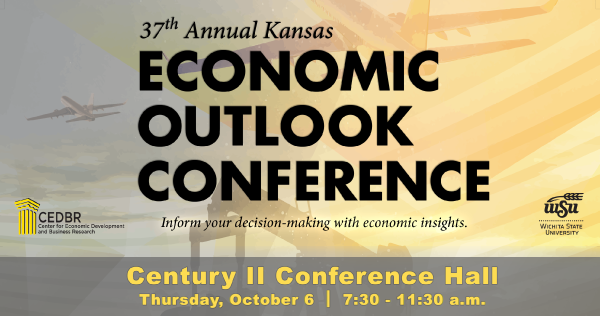 For a glimpse into the region’s economic future, over 700 business leaders turn to Wichita State University’s Barton School of Business and Center for Economic Development and Business Research (CEDBR), founders of the Kansas Economic Outlook Conference. The purpose of the conference is to provide insight into current local and national economies, addressing topics of interest to the community, region and state. A combination of nationally known speakers and local experts will be on hand to provide perspectives on issues affecting business, industry, education and government. "Good overview of global, national, and state economic conditions and forecasts." "Great event! Good to see what is coming up on the horizon, both globally and in our local economy. Great networking as well." "Excellent tool for preparing budget." "One of the best for movers and shakers"
"The information presented will be extremely helpful as we help our clients work on strategic planning for the coming year." "The information presented, especially about the local economy...is important to know for anyone in the business world." October 06, 2016 | Century II Convention Hall | 7:30 – 11:30 a.m.
Richard Aboulafia is Vice President of Analysis at Teal Group. He manages consulting projects in the commercial and military aircraft field and analyzes broader defense and aerospace trends. He has advised numerous aerospace companies, including most prime and many second- and third-tier contractors in the US, Europe and Asia. He also advises numerous financial institutions on aerospace market conditions. Aboulafia writes and edits Teal Group's World Military and Civil Aircraft Briefing, a forecasting tool covering over 135 aircraft programs and markets. He also writes publicly about aviation and defense, with numerous articles in Aviation Week and Space Technology, the Wall Street Journal, Financial Times, Professional Pilot, and other publications. He has a regular column in AIAA's Aerospace America. Frequently cited as an aviation industry authority by trade and news publications, Aboulafia has also appeared on numerous television news and radio programs including ABC, BBC, Bloomberg, Reuters, CBS, CNN, NBC, NPR and PBS. He has spoken at numerous conferences, including ATRIF, NAFA, NARA, Network for Aerospace Management in Europe (NAME), and Speednews. Before he joined Teal Group in 1990, he analyzed the jet engine market at Jane's Information Group, served as an aerospace industry consultant for an international trade advisory company and supported research projects at the Brookings Institution. He has a Masters degree in War Studies from King’s College, University of London and a Bachelors degree from George Washington University. He lives in Washington, DC with his wife, Casey, son, Simon, and daughter, Wren. Caron Lawhorn is senior vice president, commercial of ONE Gas. Headquartered in Tulsa, Oklahoma, ONE Gas, Inc. provides natural gas distribution services to more than two million customers in Oklahoma, Kansas and Texas. In her current position, Lawhorn is responsible for commercial activities of its three natural gas distribution utilities–Oklahoma Natural Gas Company, Kansas Gas Service and Texas Gas Service–including business development, customer service, gas supply, information technology, performance management and rates and regulatory. Prior to ONE Gas becoming a stand-alone publicly traded company separated from ONEOK, Inc. in early 2014, she served in the same role at ONEOK. Lawhorn began her career at ONEOK in 1998 and stepped into several leadership roles before assuming her current position. Prior to joining OKEOK, Lawhorn was a senior manager at KPMG and chief financial officer of Emergency Medical Services Authority in Tulsa. Lawhorn serves as secretary-treasurer of the board of directors of the Southern Gas Association; vice chair of the board of directors of the Tulsa Area United Way; and a past chair of the Women's Leadership Council. She is a member of the board of trustees of Saint Simeon's Foundation, past executive chair and former board of trustees member of Saint Simeon’s Episcopal Home, a member of the American Institute of Certified Public Accountants, and a graduate of Leadership Oklahoma–Class 21 and Leadership Tulsa–Class 32. Lawhorn earned her Bachelor of Science in business administration from the University of Tulsa, and is a graduate of the Harvard Business School’s Advanced Management Program. Mykel Taylor is an assistant professor in the Department of Agricultural Economics at Kansas State University. Dr. Taylor’s research and extension programs are focused in the areas of crop marketing and farm management. She grew up on a cattle ranch in Montana and attended Montana State University majoring in Agribusiness Management. She has worked in extension positions at both Kansas State University and Washington State University. Some of her current research areas include measuring basis risk for commodity grains, understanding the implications of food safety and country of origin labeling on meat demand, and analyzing trends in Kansas agricultural land values, rental rates, and leasing arrangements. Hill has been involved in a number of national and regional organizations, including the Association for University Business and Economic Research, for which he currently serves as president, the National Association for Business Economics, and the Kansas Economic Development Alliance. Hill was also one of only 40 Kansas business professionals chosen to be part of the 2015 Leadership Kansas class. Stephanie Bergmann is a well-known face on Wichita television, now co-anchoring the weekday evening editions of KSN News at five, six, and ten o’clock. As an anchor/reporter with KSN since 1990, Stephanie has covered every beat, from crime to health news. Additionally, Bergmann has hosted morning, weekend, and evening newscasts. Bergmann grew up in Mulvane, Kansas and finished high school in Colorado. She earned her journalism degree from Colorado State University in 1989. Stephanie began her career as a reporter for KSNT in Topeka. She has been recognized numerous times for journalistic excellence in her career, including first place awards from the Associated Press and the Kansas Association of Broadcasters. Jason Cox is president of Cox Machine, Inc. In this role, he focuses on integrating technology with the manufacturing process. Cox holds a Bachelor’s and Master’s Degree in Mechanical Engineering from Kansas State University in Manhattan, Kansas. Before coming to Cox, he worked as a design engineer for Cessna Aircraft in Wichita. At Kansas State University, he worked as a design engineer for the College’s Advanced Manufacturing Institute. Jason currently serves on the Board of Trustees for Exploration Place, and on the Board of Directors for the Wichita Metro Chamber of Commerce. Dave Franson has led the Wichita Aero Club since its inception in October of 2008, first as executive director and then as president, since 2010. A veteran communications executive with more than 40 years of experience in the aviation industry, he is also president of Franson Consulting, a media and public relations firm he founded in 2004. His clientele has included Baldwin Aviation, Bombardier Learjet, Cessna Aircraft Company, FlightSafety International, Hawker Beechcraft, Honeywell Aerospace, and Yingling Aviation, to name some. Prior to establishing his consulting company in 2004, he held communications positions at several aerospace firms, including vice president of meetings and membership at the National Business Aviation Association; vice president of Public Affairs at Allied Signal Aerospace in Los Angeles, California; vice president of Public Relations at Cessna Aircraft Company in Wichita, Kansas; and director of U.S. public affairs for Bombardier Aerospace. Franson is a graduate of Wheaton College in Wheaton, Illinois with a Bachelor of Arts in Literature, and from Wichita State University with a Master’s in Communications. He has served on the boards of directors of Learjet, Inc., Exploration Place, the Kansas Cosmosphere, the Kansas Technical Training Initiative, the Greater Wichita Convention and Visitors Bureau, the Kansas Aviation Museum, HopeNet, and Newman University. He is currently a member of the Executive Committee of the Board of Directors of the National Aeronautic Association in Washington, D.C. He is a licensed pilot and a member of the Aircraft Owners and Pilots Association and the Experimental Aircraft Association. He and his wife, Cindy, are the parents of two grown children. Darin Greseth has served as the president of BG Products, Inc. since April 2010. In January 2014, he was appointed as chief executive officer. Greseth’s career with BG began in 1984 as a sales representative at Kenz and Leslie Distributing Co. Soon after, he worked 10 years as a sales manager for Lew Achord at Premaco, Inc. In 1997, Darin moved to Michigan and partnered with Lew Achord to form Premaco Michigan. The trio transformed the Eastern Michigan territory from the bottom 10 to the top 15 among domestic distributorships. Greseth brings more than 30 years of BG sales experience to enhance BG Products’ focus on building and marketing the best line of products and equipment to the automotive, commercial and industrial markets. Kevin Turpin is the founder and CEO of PK Companies. PK Companies has provided asset integrity, safety services and inspection technology to the oil and gas industry for over 19 years. PK Companies is made of three separate companies: PK Industrial, one of the largest certified Intumescent applicators in the United States; PK Safety, providing standby and technical rescue services with a trained team of safety technicians specializing in high angle rescue, turnaround services, regulatory compliance, crisis management and emergency medical technology in over 15 states in the United States; and PK Technology, the creator of intelliSPECTM, a mobile data collection and compliance management program that is paperless, wireless, and fully customizable to help ensure consistent and accurate data collection and control critical procedural execution in the field. Turpin has extensive experience and expertise in the area of asset integrity in the petroleum and petrochemical industry and has performed research, inspections, training and has completed projects with PK Companies around the world. Turpin has a Marketing and Management degree from Butler County Community College and is actively a part of many industry organizations. PK Companies currently works with over 100 refineries and other facilities to find cost effective solutions by creating new technologies to meet the client’s needs. Download links will become active on Thursday morning, October 6, 2016.